The material to be milled is placed between the feed and center rolls. Each adjacent roll rotates at progressively higher speeds. 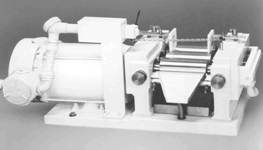 For example; the feed roll may rotate at 30 rpm, the center roll at 90 rpm and the apron roll at 270 rpm. Material is transferred from the center roll to the apron roll by adhesion. The dispersion is achieved by the shear forces generated between the adjacent rolls. The milled material is removed from the apron roll by a knife that runs against the roll. To request a brochure for the Three Roll Mill, please completely fill out the following form. You will then have access to download the brochure in PDF format or to request that one be mailed to you.